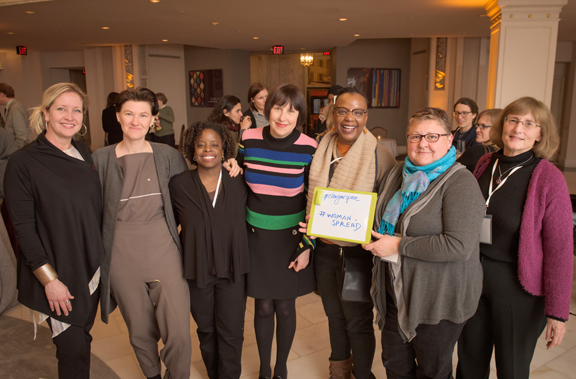 Braving post-blizzard traffic conditions in D.C., nearly 100 guests attended the museum’s third FRESH TALK—part of the new public programs initiative Women, Arts, and Social Change. On Wednesday, January 27, FRESH TALK: Can design be genderless? featured Netherlands-based designer Gabriel Ann Maher, whose work is on view in Pathmakers, and International New York Times design critic Alice Rawsthorn. 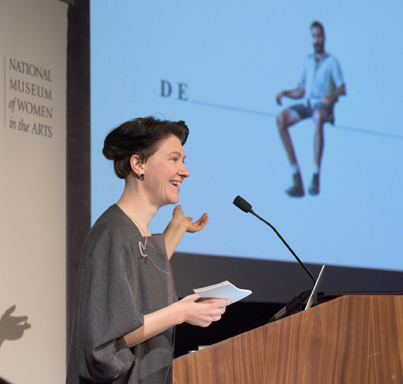 Design historian and critic Rawsthorn kicked off the evening with an overview of design, highlighting the ways design informs everyday life and how it is often gender-biased. She discussed the increasingly eclectic and fluid concept of gender identity and how it impacts design culture through digital technology. Maher, a designer who identifies as gender fluid, investigates gender through design media. Maher dissected issues of the Dutch magazine FRAME to reveal perpetuated stereotypes of “male” and “female”—from article titles to depictions of men and women designers. Maher explained how designers direct people’s self-presentation—through clothing that accentuates body shape, or through the act of sitting, in which people claim or relinquish space. The presentations wrapped with a moderated conversation led by NMWA Director of Public Programs Lorie Mertes. Rawsthorn and Maher explored ways that design could become more inclusive—from genderless bathroom signage to TSA body scanners (which are based on an algorithm for male or female forms). The speakers reflected on cultures that embrace and revere multiple concepts of gender. Both pondered how the internet can be a tool for change. 1. Seeing the world with new eyes. Guests felt more aware of their built environments. They began to consider how the world is constructed and how design can create obstacles for gender-fluid people. 2. Empathy is the name of the game. Attendees introduced themselves and shared details of their identities—which many had never considered aloud. Guests gained a greater understanding of the LGBTQ community, discussed how gender stereotypes are ingrained, and considered the impact of gender labels. 3. Your ideas for social change matter. The conversation continues online with #FreshTalk4Change. Visit the museum’s website to watch event videos. The recordings of FRESH TALK: Can design be genderless? will be available soon. This entry was posted in News and Updates, Public Programs and tagged Alice Rawsthorn, arts, fresh talk, Gabriel Maher, genderless design, Pathmakers, social change, women by Women in the arts. Bookmark the permalink.